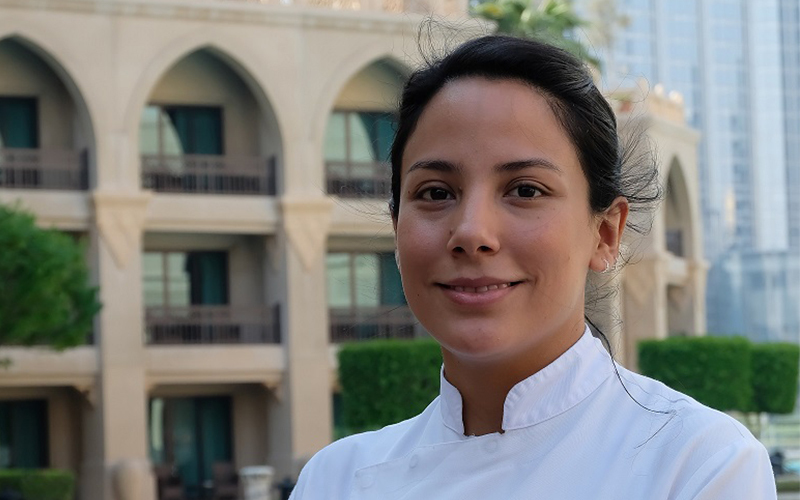 BBC Good Food Middle East chats to Chef Josefinna Vallve – Palace Downtown’s resident Chef de Cuisine at its Argentinian eatery, Asado. She tells us more about the menu changes that guests can expect in winter months, and details her top tips for creating the perfect steak. What is the inspiration behind Asado’s menu? The inspiration for the menu comes from my childhood memories in Latin America. The time to eat is one of the most important moments of the day as we all (family or friends) gather at the table to socialise while indulging in delightful dishes prepared with seasonal produce. Just like home, Asado offers authentic Argentine cuisine, premium meat cuts and flavour-forward menu in a vibrant and lively setting. What differentiates an Argentinian asado from a barbecue? An Asado is a traditional Argentinean experience. The way the dishes are prepared sets it apart from a barbeque. Besides the preparation of the delicacies, it is a social event shared by friends and family to celebrate and share conversations over food. How would you describe the dining experience at Asado? Asado at Palace Downtown is an Argentinean grill with a dynamic Latin American spirit, offering guests the opportunity to sample sumptuous meat cuts and authentic Chilean delicacies in a rustic, urban laid-back setting complete with Al Fresco terrace dining. With spectacular views of Burj Khalifa and The Dubai Fountain, Asado is one of the most unique restaurants in Dubai. What is favourite dish from the menu and why? Cabrito – a juicy baby goat – is my favourite dish on the menu. It is our signature dish and we make it in a very special way. The meat bursts with flavour and possesses a distinct taste that emanates from the slow cooking charcoal grill. Does the menu alter according to seasons? If so, what changes can we expect for the winter? Yes, Asado offers dishes depending on the seasonal produce. For example, we will serve Argentinean scallops and Patagonian mussels during the cooler months in Dubai. A large proportion of the menu centres around premium meat cuts. What advice would you give to readers who are looking to source high-quality meat produce in the UAE? Sourcing the right quality ingredients is essential. My advice it to avoid frozen meat at all cost and always buy fresh meat that is GMO and hormones free. Those who like to indulge in premium immaculately prepared meat should come to Asado to enjoy sumptuous meat cuts and the fantastic views of Burj Khalifa and The Dubai Fountain! How do you prefer your meat to be cooked, and what are your top tips in recreating this for our readers? I grill the meat before marinating it and prefer medium rare. Post grilling, I leave for few minutes and flavour it with chimichurri and salt flakes. What is the most bizarre request you’ve ever had from a customer? One guest ordered our popular dish – steak tartare – to be cooked well done, because he was concerned about certain features within the raw meat. As a child, I was curious to understand how dishes were prepared and started helping my mother in the kitchen, so I could discover her secrets. The kitchen has been my world since childhood and it was my aspiration to become a chef. I like fresh seasonal ingredients or new ingredients. I love using coriander as it complements the flavours of any dish and can be used for garnishing as well. To make a reservation at Asado, visit the website or for more information, follow @PalaceDowntown on Facebook, Instagram and Twitter. If you like the sound of Chef Josefinna’s cooking, try her classic ‘ceviche de gambas’ recipe – packed full of South American flavours.